Each year, Earth Day – April 22 – marks the anniversary of the birth of the modern environmental movement in 1970. This year Earth Day falls on a Sunday. Bring Earth Day Sunday to your faith community with the help of these resources which share a common concern that our consumption of fossil fuels and our throwaway culture are harming ecosystems and communities. Lead your faith community to move "Beyond a Throwaway Culture: Reduce Waste, Grow Community." Produced by the Catholic Climate Covenant, this facilitator’s guide prepares you for a one hour program with prayer, video, and study to learn about how single use plastics pollute aquatic and terrestrial ecosystems, contribute to climate change, and what personal lifestyle changes you can make to address this aspect of throwaway culture. Be present to your local ecosystem with "Sense of Place." Produced by Creation Justice Ministries, this resource guides us to be present to our local ecosystems even as we live in a globalized world and changing climate. It asks, "How can we act in a way that cultivates wholeness and shalom with Earth?" The guide offers quotes and insights from Pope Francis, Martin Luther King Jr., Ched Myers, and Cherokee Theologian Randy Woodley, as well as worship materials, homily helps, and ideas for advocacy and personal actions. Take action: Ask the World Bank to make a “Big Shift.” Urge the World Bank to scale up investments in renewable energy that serves impoverished communities. More than a billion people in the world still don’t have electricity, let alone affordable, renewable energy. Securing access to sustainable energy is key to tackling poverty and climate change. While governments have agreed to aim for universal access to electricity by 2030, there's a long way to go. Follow the hashtag #EarthDayDare on Facebook and Twitter. We will join CIDSE, our partner organization in Brussels, in offering a series of simple yet important challenges to curb your personal energy consumption and use of plastics. We hold brothers and sisters who suffer from storms and droughts intensified by climate change. We hold all species that suffer. We hold world leaders delegated to make decisions for life. 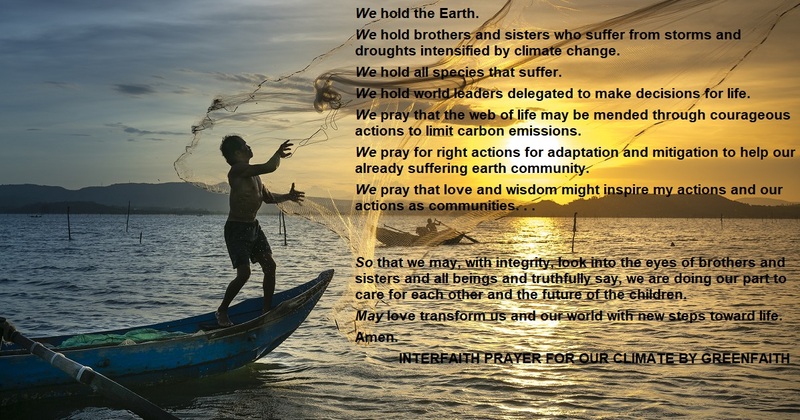 We pray that the web of life may be mended through courageous actions to limit carbon emissions. We pray for right actions for adaptation and mitigation to help our already suffering earth community. We pray that love and wisdom might inspire my actions and our actions as communities. . . So that we may, with integrity, look into the eyes of brothers and sisters and all beings and truthfully say, we are doing our part to care for each other and the future of the children. May love transform us and our world with new steps toward life.